Is an exceptional source of iodine and minerals to help re-equilibrate the thyroid gland. To help in the normal function of the thyroid gland. Need to regulate your metabolism? 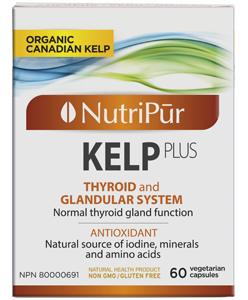 KelpPlus an exceptional source of iodine and minerals to help re-equilibrate the thyroid gland. KelpPlus helps in the normal function of the thyroid gland. The thyroid gland produces hormones that are essential in regulating multiple body functions such as: fat metabolism, body temperature, heart rate, energy and maintaining a healthy nervous system. A unique blend of different species of kelp that provides the body with a natural source of iodine and minerals necessary to maintain thyroid health. Kelp grown without herbicides or pesticides. All natural source. Non-medicinal: Maltodextrin (vegetable source), magnesium stearate (vegetable source), hypromellose (vegetarian capsule). Irregular or heavy menstrual periods. Adults: Take 1 capsule, one to three times a day, or as directed by a health practitioner.